It was just before the 2015 General Election when I posted my first Kippers and Greens blog article and a lot of water has flowed under the bridge since then. While dominance by Conservative (attracting big business and small government) and Labour (attracting the lower classes and societal control) in UK politics has been a consistent theme since as a young teenager I became politically aware, with the Lib Dems (along with their SDP and Liberal predecessors) having a marginal and occasionally significant impact by being able to attract the in-betweeners, yet like UKIP and the Green Party in recent years, it has been unable to dislodge the big two when it really mattered. My own political journey has been well recorded, starting from almost joining the Labour Party as an older teen, before religion got in the way, and then, partly because of religion, turning against them when observing threats I perceived to the rule of law, when as a student and then as a young teacher. After that I was a floating voter and did not pick up again seriously on my political interests until relatively recently, partly as a result of my community activism, realising that like it or not, politics is a significant factor. These days I can best describe myself as a middle of the roader, sitter on the fencer, passionately concerned with social justice issues and matters of individual freedom, recognising too the dangers of adopting a neither here nor there type position, and while I see the value of political participation, I am unconvinced by any party. I like to think I have friends in all the parties, engage with all the parties for the common good and do influence those belonging to all the parties. As for voting, I can say regarding the 2015 elections, bizarrely maybe, I voted for Green nationally and UKIP locally, but in order to understand my reasons you will need to read my blogs written around that time and understand my deep soul searching. As I reflect on the future of these two parties, I still see a lot of mileage ahead. Some battles like to do with austerity still need to be won as far as the Greens are concerned, and while UKIP may have been a principle catalyst for voting to leave the EU, there is much still to be done to secure their vision for the UK. We have a new government that appears to be weak on the environment and already showing signs of backtracking on Brexit. It occurs to me that if that is the case there is work for both the Greens and UKIP to do. As I reflect on Kippers and Greens at this point in time, I do not do so wearing rose tinted glasses, for I have been critical of both while recognising some of the good points in both. Given the amount of popular support both have, having two MPs between them seems grossly unfair. As I reflect on the recent May local elections though, I couldn’t help noticing that the Green vote continued to rise and UKIP continued to poll well, although I was irritated that, in my own ward, a poor UKIP candidate polled almost as well as very good Labour and Conservative candidates, demonstrating, as if we didn’t know already, the superficiality of the electorate at large, who may well have voted with the EU Referendum in mind, ignoring more relevant local issues. In that same ward vote, incidentally, an enthusiastic Green candidate polled surprisingly well, and on local issues, demonstrating here is a voice that we should not ignore. In a sense, the past needs to remain the past, but it would be foolish to ignore the past when deciding how to act in the future. Advancing age, reducing powers and having my work cut out carrying out my gospel preaching, community activist duties and trying to be a good husband and dad, means at best I will only watch and commentate on what is going on and perhaps be of some help to those more actively engaged politically. Regarding how Kippers and Greens see each other, it is a far cry from how I see them. 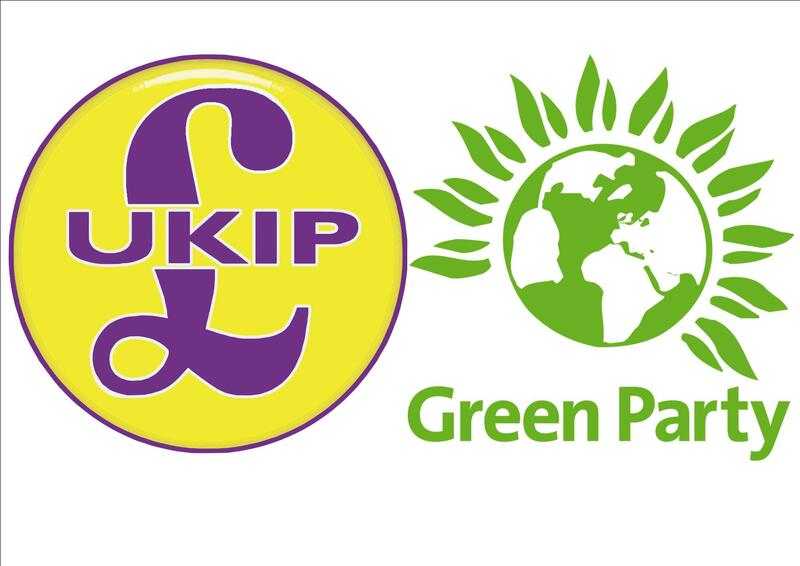 While the two parties may appear poles apart, with some Greens looking upon Kippers as bigoted, xenophobic, homophobic, racist, nasty reactionaries and some Kippers seeing Greens as luvvie, looney, lefty, cloud cuckoo, tree huggers, my own views are more measured and I am grateful to both for sharing their particular perspectives and believe both have something worth contributing. Like any party, Kippers and Greens attract an extremist minority. On the Kipper side, stirring up racial hatred is an obvious issue; as for the Greens, and maybe less obvious, there can be a propensity to vilify those that don’t fall in line with their more liberal beliefs and agenda. As far as community activism goes, I have witnessed first hand members from both parties making outstanding contributions to serving their communities, and have happily worked with some of them. While politics can be a corrupting business, as far as I can make out, most politicians are in it for the right reasons and given their limited likelihood of power that is especially so for Kippers and Greens. One senior Kipper friend recounted to me the story of John Bunyan, who spent 12 years in jail on account of his religious conscience and in part inspired him to become a Kipper. One senior Green friend recounted to me his view that the world is facing an environmental catastrophe and, as things currently stand, only the implementation of Green policies can prevent this from happening. I have no doubt that for both friends, what they perceived and experienced were deciding factors behind their making the choices they did make. What is of particular interest given my more ecumenical approach to religion these days is as far as my more conservative, traditionally minded Christian friends are concerned, their inclination is to vote UKIP and as far as my more liberal, socially minded Christian friends are concerned, their inclination is to vote Green. There a lot of course that haven’t a clue, don’t care or vote on a whim. There are notable exceptions of course but I am convinced in the main that is how it is. It also relates to some of the divisions we are seeing in society, that permeate down to the church, although I would rather see the church take on the things its head (Christ) said were important: preach the gospel, teach/live the truth of God, serve the poor and the oppressed, live in unity with one another and be healers and peace makers. We all have a list of things we believe to be important and this can differ widely. We do well to understand this. Our failure to do so can create avoidable and regrettable division if it is the common good we seek. For the more thoughtful among us, when it comes to deciding where to put our cross on the ballot paper, it depends on what importance we attach to those things we value and how politics might deliver as to how we vote. How I am likely to vote in the future is neither here nor there, but the type of country I want ours to be is. Having had recent acrimonious exchanges with politically minded friends and then taken to task by sympathetic folk close to me with no vested interest in these matters, it occurs that if I am to re-engage in the blogosphere then just maybe I should play my cards closer to my chest. What is abundantly clear though, there is a gospel to be preached and a community to be active in, and that is where my efforts ought to be concentrated on the few years left when I can make a difference. It also occurs that it might help in so doing that I continue to engage with both Kippers and Greens, because whether one likes it or not, both have their parts to play.